Last month was my younger son's birthday and chocolates being his favorite,I decided to make a marble cake as it has both vanilla and chocolate flavors.I just frosted the cake with chocolate butter cream and topped with chocolate ganache.The cake was very soft and delicious with chocolate butter cream filling.I wrapped the sides with toasted walnuts.All at home loved the cake which usually is hard to get that response from all at one go.My hus totally loved the cake and complimented saying it was one of the best tasted frosted cakes so far.What more can make you happy? ?The birthday boy was even flying high with all chocolate treats.He had a great day at school too with cupcake birthday party.This cake can be made ahead and wrapped in cling wrap and frosting can be done the following day.I have already posted an eggless marble cake sometime back which can also be used which is definitely a fool proof one.However,I wished to have a marble cake with eggs and so followed this recipe.Do try this out if you have a birthday around or for any other occasions.Enjoy !!! Pre heat oven to 350 degrees F and line a 8" square or round tray with parchment paper on the bottom,butter the sides.Keep ready. Sift the cake flour(read notes),baking powder,baking soda,salt. In a heat proof bowl,melt the chocolate with coffee.Remove from heat and mix well.Keep aside to cool. Beat the butter in another bowl until smooth.Gradually add the sugar until light and fluffy,scrape down the sides as needed(takes 3-5 mins).Add the eggs and beat again.Mix in vanilla extract and yogurt. 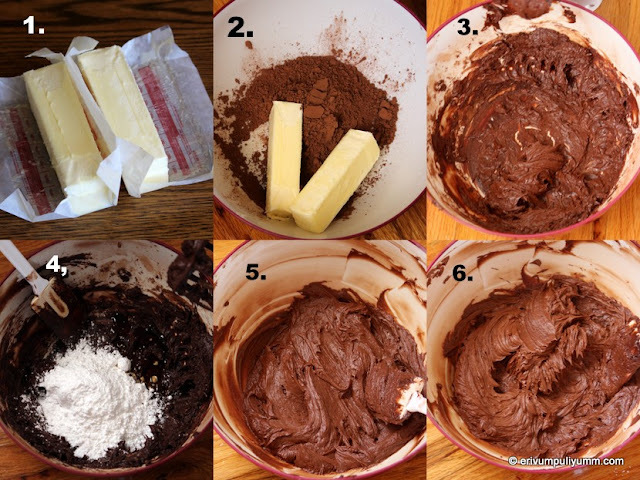 Now add the sifted flour mixture in three additions with little milk each time.Remove a little lesser than half of the batter to the bowl with melted chocolate.Mix well. In the prepared tray,add 2tbsp of vanilla batter first,then add the chocolate batter.Keep alternating the batters and pouring on top of each addition(to get a zebra pattern,use round pan and add the batter one above the other in the center and the batter will spread evenly) till you finish both batters or just dump as you wish and just by running a fork in the batter gently at the end to get swirls(don't over mix). Bake in pre heated oven 30-35 mins or until the tooth pick inserted in the center comes out clean.Remove from oven and leave to cool for 20 minutes.Remove the cake from the oven and leave to cool completely. Similarly,prepare the second cake and cool completely.Cover with a cling wrap and leave at room temperature till you frost the cakes. Cream together the butter,cocoa and salt.The mixture will be very thick.Scrape down the sides of the bowl. Add powdered sugar and by moving on low,mix in gradually the milk and vanilla extract. As the sugar incorporates,increase the speed of mixer to beat the frosting.Beat until smooth for a minute. 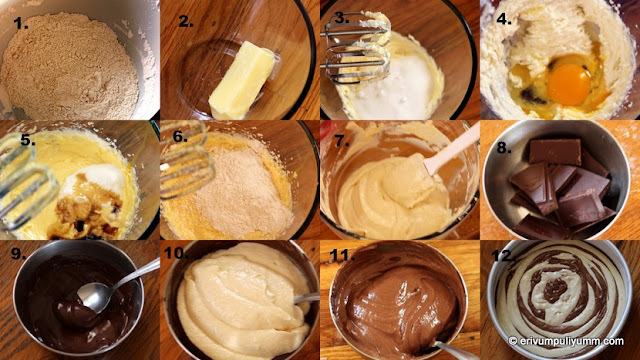 Add cream gradually until you reach the desired consistency.Store in air tight containers in refrigerator or freezer or you can use directly on cakes for frosting.Bring to room temperature before frosting. Once the cakes are cooled completely,slice out any bumpy portions on top of the cake to make it even(I hardly had any to trim out).Now apply a dollop of butter cream on the cake board or plate or wherever you would like to place the cake.Invert the top side of the cake on the butter cream.Then,start applying a thick layer of the butter cream on the cake.Then,place the next cake on top of the first cake.Again,apply a thin layer of butter cream all over the top and sides to crumb coat.Refrigerate the cake for 2 hours. Now remove the cake from refrigerator and apply thick layer all over the cake(I haven't used very thick coat as none likes at home,if you wish to do that then increase the butter cream amount when making).Even up the top as much as possible. If you are using toasted nuts then,follow the steps below.Else,nuts may not stick to the sides.Then refrigerate the cake for 2 -3 hours. Toast the walnuts at 200 degrees F for10-12 mins until lightly toasted.Break them in pieces or coarsely chop.Place the cake on a cake stand or plate and take handful of the nuts.Press the sides with the nuts.Remove any excess that falls in the sides.Reapeat doing until you finish the whole round. Place the chocolate in a heat proof bowl.Set aside.Heat the butter and cream together in a bowl over medium heat.Bring just to a boil and immediately pour the cream over chocolate.Allow to stand for few minutes.Stir gently with a spoon until smooth.Use over the cake and let it stand for 5 minutes.Let it drip through the sides.If you wish a slightly thinner consistency then add more cream.Draw free patterns and serve the cake by slicing. 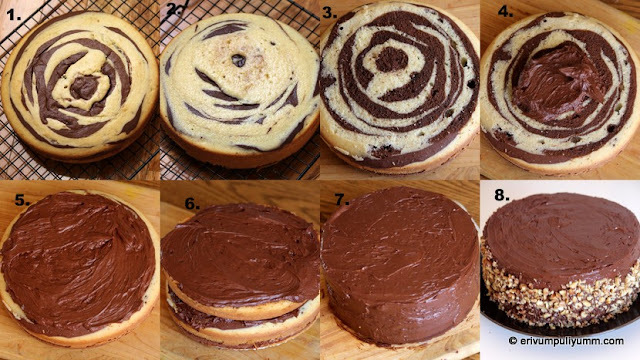 *The marble cake recipe is adapted from here,the chocolate butter cream recipe is from here. * In the chocolate butter cream,the recipe calls for add 2/3 cup rich chocolate ovaltine powder.But I have omitted that which works fine too. * The sugar can be increased to 3/4 th cup in the cake batter as the cake is mild in sweetness. What a gorgeous layered cake! Perfect marble effect and texture. What a fabulous cake dear..sooo perfect. Belated Happy Birthday to ur son..God bless him. Wonderful looking cake. Loved it! i dont want to make this, better is if you can parcel me please. It turned out perfect and tempting! Cant take my eyes off that cake Julie!!! Adipoli... love the way the marble pattern has come out, the decoration, the nuts on the side... everything about it! Beautiful cake, looks so amazing and am sure would have tasted yummy..
Gorgeous cake Julie, the marbling effect has come out very well.. I love making Zebra cakes!! They are fun to make and results in an eye catching visual treat!! Belated birthday wishes to your little one! Hi Julie..Thanks for the awesome recipes.Admire your passion and patience for getting this out to us. By the way,In the marble cake recipe(Marble Cake with Chocolate Buttercream Frosting and Chocolate Ganache topping),can you mention how much butter is required for the chocolate ganache topping?I could not find it in the recipe. Also,Thanks Shilpa for all d inspiring words and appreciation.. am glad you loved it ! !